One of the most popular 2D shoot-em-up games of all times lands on your android. 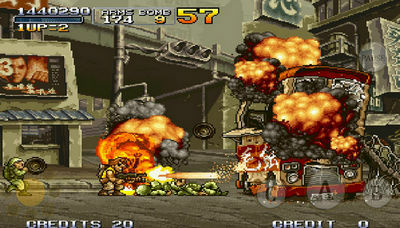 METAL SLUG X is a remake of Metal Slug 2, a classic 2D action adventure where you get to shoot enemies and blow up stuff of all types and sizes. - New weapons, such as the Iron Lizard, the Drop Shot,etc. - Autofire control function with customizable configuration schemes. 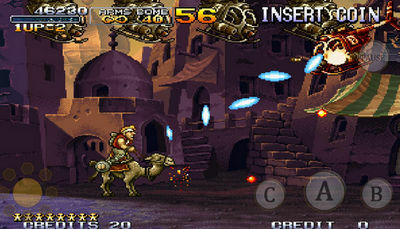 Enjoy every pixel of “METAL SLUG X” with your very own custom controls! - Engage into intense Multiplayer gameplay via Bluetooth! - Complete “ACHIEVEMENTS” to increase your "METAL SLUG X" Player Rank and become the best! Grab the game below and play, the battlefield awaits! Install Apk, Copy ‘com.dotemu.neogeo.mslugx’ folder to sdcard/Android/obb/, and have fun!